Michael and Jessica Bartlett with their three boys. "I wanted to go to there more than anything. There was no second choice," Michael says. "Now that was in jeopardy." "For my St Louis U. High education and the foundation that it provided me, I am indebted to the donors who funded my scholarship," says Michael Bartlett '96. "Receiving help in the form of a scholarship not only made me strive to do my very best, but also made me want to give back in any way possible." Michael was one of four Bartlett boys to attend the U. High. Twin brothers Matt and Brian graduated in '93 and were known during their student days as "the Bartlett pair." Younger brother Andrew graduated in 2002. "When I was in seventh grade, my father died suddenly of a heart attack," Michael says. "My mom was grief-stricken, of course. We all were. It was completely unexpected." Besides their emotional loss, the death affected the Bartletts financially. "My father was working full time in addition to serving in the Army Reserve. My mom was a full-time mother of five children and a part-time substitute teacher. She was very anxious about our finances in general, as well as having the sole responsibility of providing the best education possible for her children—something my parents had always made their top priority. How would she pay for two, soon to be three, boys at SLUH? I was too young to fully appreciate it at the time, but looking back I can understand how worried my mom was," Michael says. "I remember her telling my brothers and me of the possibility that we might not be able to attend SLUH," he says. "My brothers and I would have been devastated. They loved the high school, and even though I was only in seventh grade, I witnessed firsthand the countless positive effects it had on my older brothers, and I grew to love the school as well. I wanted to go to there more than anything. There was no second choice. Now that was in jeopardy." Michael's mom, Karen Bartlett, arranged a meeting with the principal as soon as she could. "He assured me that my boys were welcome at Backer Memorial, and that financial arrangements would be made. What a relief that was," Karen says. "And it wasn't just the financial support that made a difference. The caring atmosphere at SLUH; the support my boys received; the male role models on the faculty and staff—all of it was crucial during this difficult time." "I don't know that I could have gotten through that time without St. Louis U. High," Karen says. "I do not think I could have either," says Michael. "As a scholarship student, I remember writing a thank-you letter every year to the benefactor who made my time at SLUH possible," he says. "I was so grateful. Being there meant everything to me. I immersed myself in school life." After high school, Bartlett attended Lake Forest College in suburban Chicago. He received his MBA from the University of Chicago's Graduate School of Business. 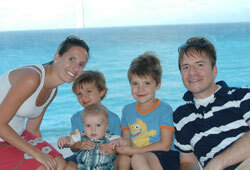 Today Michael lives in Hudson, Ohio, with his wife, Jessica, and their three sons, William, James and Henry. He continues to work in the finance industry. "To whatever extent I have been successful, I credit a large part of it to my SLUH experience. I learned so much, both in and out of the classroom. Even after almost 16 years, I still say St Louis U. High taught me how to think," he says. "When I was a student writing that annual thank-you letter, I vowed that I would give back to the school. In addition to making an annual gift to my class scholarship fund—named in honor of one of my best friends, Patrick Boyce—I still hope to one day fund my own full scholarship, and my wife and I have since incorporated SLUH into our estate planning. I always find myself either wanting to give more or wanting to give more often. I wrote seven years ago that I plan to pay it all back—plus interest. Today, I hope to nudge others to give something—anything—back too." A look at the list of donors from the Class of '96 shows that Bartlett has kept that vow. He has made an Alumni Fund contribution every single year since 1997, the year after he graduated from SLUH. Click here to learn about SLUH's scholarship program and how you can support the school by establishing a scholarship.